Celle Task Chair | Herman Miller Office Chairs | Herman Miller Furniture (India) Pvt Ltd. Delivery: Up to 10 days from shipping depending upon the location. With its dependable, hardworking design and the durability of its Cellular Suspension material, Celle is a great choice for even the most demanding settings. Beyond working in a wide range of spaces, Celleâ€”with its roomy proportionsâ€”also fits a wide range of people. Its versatility extends to its appearance as well. An inspired palette of warm colors balances Celleâ€™s highly technical design. Its most popular configuration blends the performance of a suspension back with the familiar aesthetic of an upholstered seat. A fully upholstered version is also available. No two of the 751 polymer cells in the chairâ€™s patented Cellular Suspension back are alike. The cells and interconnecting loops are engineered to form a â€œflex mapâ€ that conforms to your unique shape and stature, supporting your back while allowing air flow to keep you cool. As you lean back, Celleâ€™s Harmonic tilt prevents your lower back from pulling away from the backrest, keeping you balanced and supported as you move naturally through the chairâ€™s 28-degree recline range. Passive PostureFit sacral support is designed into Celleâ€™s Cellular Suspension back, a feature that tilts your hips slightly forward so you maintain proper spinal alignment. With its roomy proportions, Celle fits 90 percent of the global population and is rated for people up to 350 pounds (159 kg). Adjustments let you personalize the fit. Designer Jerome Caruso has been called the "King of Cool," not because he's a hipster, but because he is and has been Sub-Zero's designer for more than two decades. He is responsible for the look of the company's entire line of luxury refrigeration units. Caruso studied design in the 1960s at the University of Copenhagen and was strongly influenced by the design style of the time. "Danish modern was all the rage," he says. "My primary inspirations are ergonomic and to invent something that is both a good concept and outstanding aesthetic." Caruso doesn't limit his design talents to refrigerators, or the Celle Chair. The holder of nearly 100 patents, he has also worked on LCD electronics, two dozen Wolf stove appliances, and furniture. Sitting causes pressure on bones and tissues. Celle was designed using pressure mapping to properly support your body without aggravating the body's pressure points. When asked in an interview what one thing he wanted to accomplish before he died, Caruso said, "The closest that I can get to the 'perfect' chairâ€”an elegant solution that contributes real progress in terms of long-term support and comfort." Well, Celle isn't perfectâ€”it's only 98 percent recyclable, after allâ€”but we believe it comes close. Offering advanced ergonomic support, easy adjustability, and ecological sustainability, Celle provides an affordable and good-looking seating solution for the home office. From upright to reclined, your body stays in healthy alignment with Celle's Harmonic tilt. Designing the Celle chair was the "Mt. Everest of fun," he says. "At the beginning, I imagined a highly engineered, 'intelligent' surface that could be the ultimate in seating comfort. I envisioned hundreds of tiny 'cells'â€”each one consisting of a pad with spring-like loops that would both support and respond to different anatomical areas." After working on his idea for two years, Caruso approached us with his concept. "I wanted to make a seat that was more flexible, had more variations, and had an outstanding design," he says. 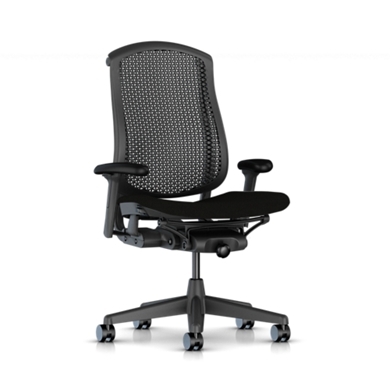 He wanted his design for Celle to update the look of the office chair, while ensuring that it contributed healthful, ergonomic support with inventions such as the Cellular Suspension system. options available for your order. 40.5" x 28" x 28.5"
Wash surface with a soft cloth soaked in mild detergent and warm water. Rinse thoroughly and dry with a soft cloth. Do not use solvents or abrasive kitchen cleaners. Wash with a soft cloth soaked in mild detergent and warm water. Rinse thoroughly and dry with a soft cloth. Apply isopropyl alcohol to a clean, damp absorbent cloth. Start at the outside of the ink stain and work towards the center. Apply pressure but do not rub too vigorously. It is important as the cloth becomes stained, use a clean section of the dampened cloth or the stain will spread. Apply isopropyl alcohol to the cloth as needed. If ink stain persists, use acetone in place of procedure above. This procedure is not intended for normal cleaning. Vacuum or dust frequently with a clean, dry cloth. If leather is soiled, it can be wiped with a soft, damp cloth using a lather of any mild soap with lukewarm water. Wipe clean with a damp cloth and dry with a clean, soft cloth. Do not spot clean leather; clean the entire surface. Wipe excess liquid immediately with a clean cloth or sponge; let the leather air dry. If further cleaning is necessary, sponge the entire surfaceâ€”seat or backâ€”with clean, lukewarm water. Let the leather air dry; never use a hair dryer or other heat source to dry leather. Do not apply water or try to wash a grease spot. Do not use saddle soap, cleaning solvents, oils, furniture polishes, varnishes, abrasive cleaners, detergents, or ammonia on leather; they will ruin the finish, causing it to become sticky and cracked. If the stain remains cleaning, contact a professional cleaner.